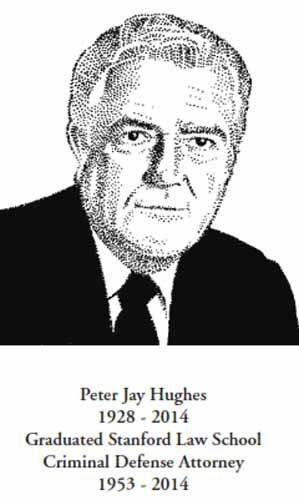 Peter Jay Hughes approached every day with passion, optimism, curiosity, humor and a grateful heart. He marveled at his good fortune and paid-it-forward at every opportunity. Peter grew up in Los Angeles, graduated from Stanford Law School in 1953 and served as an Army JAG officer in Washington, DC. In 1957, Peter and his new wife, Doris, moved west for an opportunity in the Los Angeles US Attorney’s Office. In 1959, Peter started practice as a San Diego criminal defense attorney with Bart Sheela and John O’Laughlin. John Lightner, Ramon Castro and Mike Walsh expanded the firm. In 1979, Peter started a solo practice, soon sharing office space with Jack Phillips and later with Chuck Sevilla. For 40+ years, until the day he died, Peter’s practice was anchored by his paralegal and office manager, Mary Jessup. Peter was absolutely devoted to his craft and his colleagues. He reveled in the comradery, the spirited intellectual debate, and, the collective pursuit of justice amid life’s complex circumstances. Grounded by his Catholic faith, Peter valued and demonstrated integrity, discipline, and kindness. He mentored young people, coached fellow attorneys and rejoiced in their successes. He worked to improve the legal system and fully committed to every client. Some turned their lives around and stayed in close contact for decades. Peter was proud to be affiliated with the University of San Diego, where he served as a Trustee for 30+ years. He was a regular volunteer at All Hallows Church. Ostensibly to reduce stress, he started racing cars at age 53, the number on his SCCA vehicles. Peter's numerous professional affiliations included the San Diego Criminal Defense Lawyer's Club, ABOTA, The American College of Trial Lawyers, American Inns of Court and the California State Bar Board of Governors. Peter was surprised and moved when his revered legal family presented him with awards, such as the Daniel T. Broderick II Award for Integrity, Civility and Professionalism, The Defenders Organizations of San Diego E. Stanley Conant Award for dedication to indigent defense, Lifetime Achievement recognitions from the Defenders and the Thomas More Society. In July 2014 Peter received the US Courts Ninth Circuit John Frank Award.